Boat registration numbers can be made using this design system. 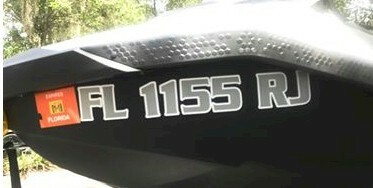 Your boat registration stickers are available in many color and sizes. All boat registration lettering comes with full instructions and free application squeegee. These number kits are made from durable easy to install self adhesive material for years of life on your boat or watercraft. Make your own US Coast Guard Approved Stickers today! These decals are sold in PAIRS. Use the drop down menu to pick the color which the decal will be applied (the background color of the boat or PWC). The finished decal will not have any background, but just be the letters on a prespaced strip for easy installation. Click on the Text entry box and start entering your text. Your text will instantly show on the preview screen. Be sure of the spelling, grammar and capitalization! Enter the height in the first box. The length is calculated based on the height, and the number of letters. If you need to make a specific sized height and width decal, uncheck the Keep To Scale box. The pricing is shown on the right of the screen corresponding to the overall size. Pick a color from the drop down menu provided. We offer 44+ colors including speciality colors. Speciality colors are higher cost options as shown. View All.